Jobs as security guards, private eyes and Maine game wardens may be available, but panel’s audience wanted to hear all about the FBI, which has a hiring freeze. WATERVILLE — Jobs as security guards, Maine game wardens, private eyes and local police officers may be plentiful in the coming years, although those who want to work for the FBI in Maine may be out of luck, a Thomas College audience was told Tuesday. 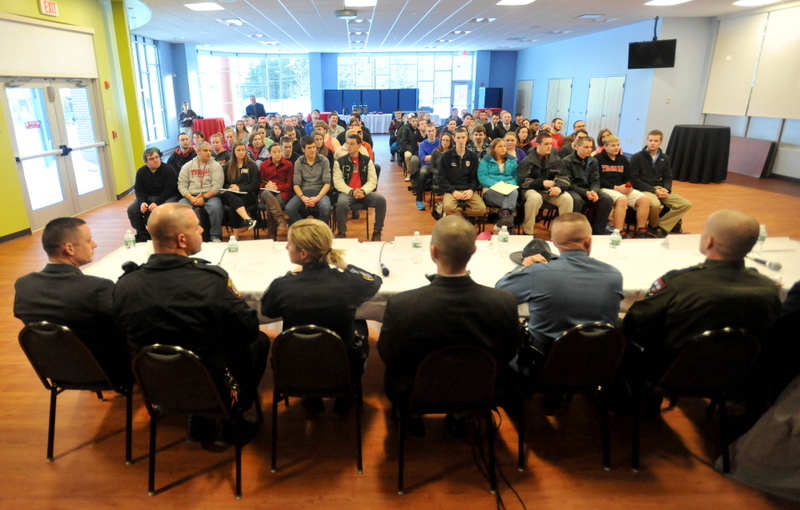 A panel of nine speakers, including representatives from the FBI, Maine Warden Service and local and state police, spoke to students, alumni and community members about job prospects in law enforcement at a panel sponsored by the Alumni Relations and Career Services department. The lack of opportunity with the FBI in the state didn’t keep the bureau from being one of the most popular topics at Tuesday’s forum. “I didn’t know there was an FBI in Maine. It really interests me,” said Sierra Hart, 18, a freshman majoring in criminal justice and psychology. Cameron Mizell, a criminal agent with the FBI, based in Augusta, said the bureau is very active in the state, particularly with a focus on pharmacy robberies. Besides pharmacy robberies, the bureau also handles things like kidnapping and extortion, he said. There are about 15 agents in the state, but the federal sequester prompted a hiring freeze. A lot of people think of the bureau as law enforcement, even though that is a small part of what it does, said Mizell. He said there are five career paths in the bureau, including counter intelligence, counter terrorism, cyber division and intelligence as well as criminal investigation. Mizell said he applied to the bureau three times before getting in and advised students that no matter what their background may be, success in their field and a clean history are important considerations when applying for a job in criminal justice. The message was echoed by other speakers at the discussion. “I deal with people from all walks of life and having people skills is very important. Don’t think there’s one particular path that will take you to where you want to be,” he said. The rewards of working in criminal justice range from getting to know and help people in small communities, doing something different every day, having a physical job and getting to do investigations into crimes across the state, the panelists said. Other panelists included Waterville Police Chief Joe Massey, Director of Surveillance for Hollywood Casinos Antonio Perez, Maj. Gen. Bill Libby, former adjutant general of the Maine National Guard; Jason LaVerdiere, chief of public safety at Thomas College; Jason Madore, Maine State Police, and Autumn Clifford, of the Saco Police Department. “It seems like there’s a lot of opportunity to help people and to experience the joy of helping people,” said Seth McIburg, 18, a freshman majoring in criminal justice with a minor in sports management. Among protective service occupations, job outlook among security guards, gaming surveillance officials and private detectives is growing the fastest, and is expected to grow about 12 percent from 2012 to 2022, according to the U.S. Bureau of Labor Statistics. The Saco Police Department is hiring and the Maine Warden Service, although nearly at capacity, will likely be hiring in the near future, according to representatives at the college on Tuesday.